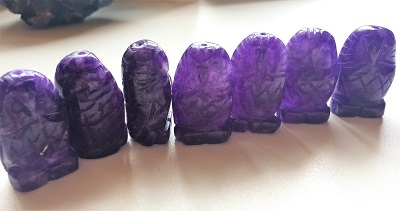 Grape purple colored carved agate owl totem beads. 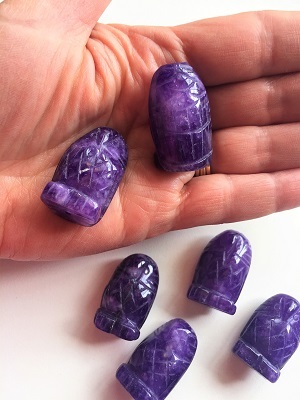 Creating emotional, physical, and intellectual balance, Agates are grounding, soothing and calming stones. 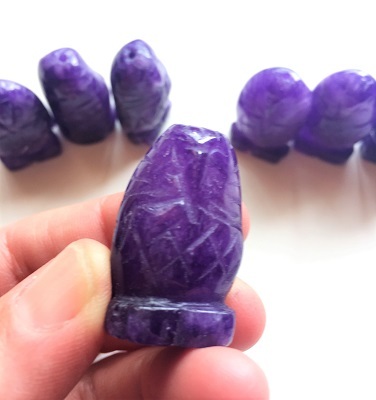 Agates aid with centering and stabilizing physical energy. Agates harmonize yin and yang, the positive and negative forces that hold the universe in place. Agate helps to build self confidence and self-esteem. Agate enhances mental functions, improves concentration, perception and analytical abilities. Agate may help one overcome negativity and bitterness of the heart. 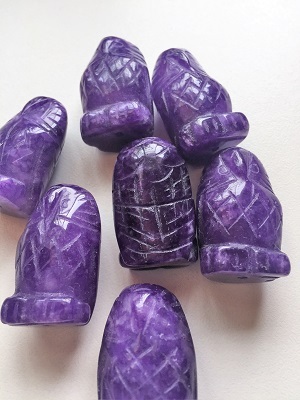 Agate helps to release anger and fosters love and the courage to start over. Agate raises consciousness, links awareness to the oneness of life and the assimilation of life experiences creating spiritual growth and inner stability. In healing, Agate is a powerful throat healer. Agate counteracts blocked self-expression releasing shoulder and neck problems, thyroid deficiencies, and throat and lymph infections. Agate lowers fever, treats arthritic and bone deformities, supports the skeletal system and may be helpful in healing fractures. Owl is a nocturnal bird of mystery and myth. The owl is a symbol of the feminine and is associated with the moon. Owl is believed to have great healing powers and the gift of prophecy and wisdom. Owl medicine you will be able to see and hear what others try to hide. Owl medicine also helps to discover your own hidden truths. Listen with your heart. You will hear what is not being said, and will be able to pinpoint what may be found in the shadows. Pay attention to signs and omens. The owl is symbolically bound to the renewal of life – cycle of death and regeneration. The depth of an owl’s wisdom includes not only the ability to bring what is dark into the light, but also has the ability to live in the dark itself.